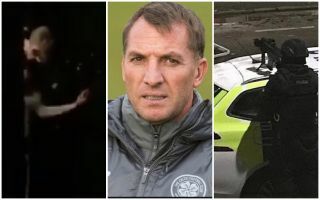 Footage has emerged of a man in Paisley apparently demanding Brendan Rodgers returns to Celtic in order to end a stand-off with armed police. As reported by the Daily Mail, it’s suggested that the man in question was seen with a weapon, and police were called to his address to deal with the matter. Further, he was arrested following the confrontation, and will appear in court on Wednesday. As seen in the video below though, he had a rather bizarre list of demands for the police to end the stand-off. It sounds as though, and has been reported as such, that he says: ‘I want a f****** bag of cans, I want Brendan Rodgers back, I want a job’. Rodgers has been met by a furious reaction since leaving Celtic for Leicester City last month, with fans of the Scottish champions far from impressed with his decision to quit and return to the Premier League despite enjoying such a successful stint with the club. As noted by ESPN, he even saw his house in Scotland broken into while his partner and step daughter were home, and so this latest incident, albeit pretty comical and difficult to believe, shows that it has certainly sparked an angry response from Celtic fans in general.